After a fitful sleep, I awaken in Cairo, thinking again about whether I can avoid looking like a religious nut while being completely myself. And there's also this question of peace. How to pray for peace? What is peace? What is my part in it? I can't imagine peace for Egypt being a warm blanket of sleepy tranquility, like being under a feather comfortor in a Swiss chalet. This is not a country of Heidis. I don't see Egypt as a nation of mushy-gushy people hugging each other in group therapy, sharing all their deepest thoughts with one another. These people are way too mistrustful for that, and there is such an incredible lack of transparency when talking about practically anything - from the price of a tube of toothpaste to what the relationship of Tantawi to Mubarek is. So what am I praying for? I think my prayer is joining in a process, entering a sort of stream trickling through the land. If I pray for trickles of peace, then I'm part of the trickle. I make the trickle of candor, of good wishes, of kindness that much broader. I also know that millions of people are longing for transparency, for justice, for accountability. That's what I've been hearing all week. I believe this trickle of longing can transform into a stream of reality. I see praying for peace as a sort of joining in to clear the stream of cosmic obstructions so that the water can flow. It doesn't have to be the mighty Nile for peace to flow. Another thing I've been realizing - when I pray for something, it's not simply a matter of asking God to bring this thing about. I need to be absolutely committed to that thing myself, pouring my own energy into that very thing I'm praying for. Peter and I get up and talk about the past week, the coming day. "It was a great week, wasn't it?" says Peter. Now that we've gotten out of Aswan without being robbed or losing our entire savings to hawkers, now that we have several days ahead of Mohammed's protection, yes. It was a great week. We have traveled by ourselves in a completely foreign culture. We've learned a lot. We've had incredible experiences. Yes - it was wonderful! Mohammed joins us for breakfast, and then we leave for church. We walk along treacherous sidewalks. Every time there is a high curb (sometimes they feel a bit like climbing onto a donkey), Mohammed is there, holding my elbow, helping me up onto the curb. We reach Kasr El-Doubara, the Protestant church the people from Open Doors told me about. Outside the church, in the courtyard, stretchers are laid out. This is the field hospital set up to care for the injured in demonstrations. Many demonstrators have been treated at this very church, Muslims and Christians alike. Inside, it looks much like any American Protestant church. In fact, this church was started in the 1940s by Presbyterian missionaries. Now it claims to have over 8,000 members. Today there is a guest speaker, an Englishman who speaks about - of all things - peace, centering his sermon on the dove that hovered over Jesus at the time of his baptism. He continues with what I was thinking about earlier this morning. He says that living in peace is an extremely difficult thing. It means forgiving those who hurt you, continually being open to the one who seems to be your enemy, changing the way we look at people, trying to see them in context, letting go of black and white categories, and letting go of revenge. Yes! We also notice that in the translation, "God" is "Allah" - in this evangelical Protestant church. After the service, we have a hearty discussion. I tell Mohammed how different this sermon is from some I've heard in America or on "Christian" TV, where the tenor is often more like, "God bless our troops". Or, "God bless my plans to get rich." I tell him that the sermon we just heard is more like what I hear Jesus saying in the Sermon on the Mount in the gospel of Matthew. I find it a sermon reflecting the heart of Jesus. 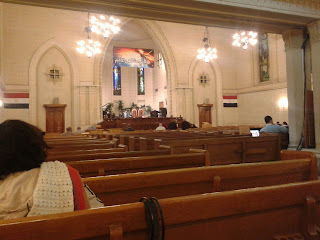 Mohammed tells us how this church differs from a Coptic one. It's his first time in an Egyptian Protestant church. "It's so simple!" he says. "No icons, no statues, no holy of holies, no secret places." We tell him a little about Protestantism. In fact, this entire day is devoted to Christianity. We will visit Jayson and Julie Casper, who are Christians, and after lunch go to a Coptic church or two. Jayson calls. He's having an interview with one of the presidential candidates, and it's taking time. Could we come for dinner instead of lunch? Mohammed says this suits us all much better. We can see the churches first, and he will take us to the Caspers to make sure we get there safely, and then return to his own home. What a relief! We can now speak freely. We don't even know the Caspers yet, strictly speaking. Our "mutual acquaintances" are our respective blogs we've been reading. I sought them out because their blog impressed me. Now we can get to know them in our own time and culture. We walk straight across Tahrir Square to take the metro to Old Cairo. Our first stop is the Hanging Church, one of the oldest churches in the world. It is exquisite, and once we're inside, it feels intimate. Mohammed explains the history of the Coptic church, how they had a slightly different doctrine about the divinity of Jesus, the monophysite doctrine. They believed, like the other Christians, that Jesus was both human and divine, he says, but his humanity was dissolved in the divine, like a drop of vinegar in an ocean. They became persecuted for this doctrine, which the rest of the church called a heresy, but the Muslims, when they invaded Egypt, agreed to protect them. Many of the earliest important church fathers, like Origen, were Copts. 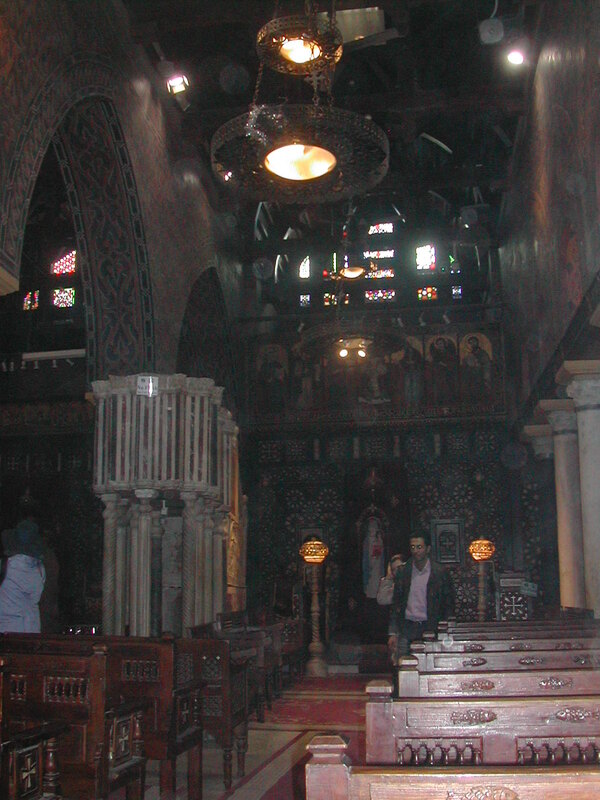 The Coptic church was the church of St. Anthony and the desert fathers, who started the monastic movement. Peter asks if there is anything of the Pharaonic period in the Coptic church. Of course! exclaims Mohammed. The pharaohs used incense, and the pharaohs and their priests covered their heads in skull caps. We look at the Roman pillars underneath the church - the church is literally hanging on a couple of pillars! He says it's pretty stable, though. There is beautiful, ornate woodwork - ivory inlaid eight-sided stars, five-sided stars, stars of David, crosses all in two colors of wood, just like we saw in Aswan, but beautifully done. The ceiling is pure dark wood, barrel-vaulted. We leave the church, walking along a wonderful narrow road, one of the oldest in Cairo. The walls are lined with books - an outdoor bookstore! We head for the next church, St. Sergius. There is lovely Coptic woodwork, but not as beautiful in the Hanging Church. The most remarkable thing about this church is the crypt, which is supposed to be the exact place Mary, Joseph and baby Jesus escaped to, hiding from Herod during their sojourn in Egypt. Mohammed takes us on a long Metro ride to Maadi, accompanying us all the way to the Caspers. "Are you sure you'll be OK getting home?" he asks. "If there's any problem at all, just call me and I'll help you." We are sure we'll be all right. We are instantly surrounded by warm famly love. It is immediately obvious, looking at the posters and wall hangings explaining the names of the children, that this is a Christian family, in the best sense of the word. We play with the children, watching them open "surprise eggs" we have brought from Germany. Julie tells us how they came to live in Egypt. She tells us stories about some of the Muslim women who are her friends. One of her friends wears the niqab because she feels better that way. It is her free choice. We talk about whether it is possible to live a Muslim lifestyle and be a follower of Jesus. She directs us to a book on the very subject, Pilgrims of Christ on the Muslim Road, written by Paul-Gordon Chandler, who is currently rector of the Anglican church in Cairo. It seems logical to us to live this lifestyle. Why not? It's similar to being a Messianic Jew, a practicing Jew who believes in Jesus as the Messiah. And yet - Jesus is the stumbling block in each of these religions, for the very thing that the Copts were persecuted for, for claiming that Jesus is God. And also that he is the promised one. Over dinner, Jayson tells us a little about his interview. He has met with a candidate for president who once belonged to the Muslim Brotherhood, but who was dismissed from their party because he is running for political office. He believes people should be free to change religions as they will, and the religion stamped on their passports as well. This idea also makes him a controversial figure in the Muslim Brotherhood. At present, there is no possibility to change what is written on someone's passport. Once a Muslim, always a Muslim. The more he talks, the more we feel this confusion, this blurring over what is fact, what is rumor, and what is paranoia. He tells us about a document supposedly found in the office of one of the Americans recently arrested. Apparently this document had Egypt divided into four regions - one for the Copts, one for Nubians, etc. This has provoked a huge outrage. Americans plotting to divide their land up, all in the name of democracy! Egyptians are going so far as to say that these NGO workers, ostensibly sent to promote democracy, were really sent to incite chaos, so that then the Americans can come in and taking over. It is shocking to imagine that my country, under the leadership of Obama, could even contemplate doing such a thing. What is true? 1. Pray against political game-playing. 2. Pray against power struggles. 3. Pray that the Egyptians resdiscover hope. 4. Pray for the new constitution, that the Egyptians are able to create a good document. 5. Pray for a good person for president. 6. Pray for the Church, that it would rediscover love and its application - for a creative love. 7. Pray for the Church to truly be salt and light in the community. 8. Pray for the people in the Church, to be able to learn the principles of the Kingdom of God instead of quarreling over doctrinal differences. Jayson and Julie are committed to staying in Egypt, praying for and supporting Egyptians in their struggles. I have just spent an evening with wonderful people, whom I wholeheartedly wish the best.